As with previous Trumpeter releases the Krupp Steyr Waffentrager comes in their usual sturdy open top box. The box is a good bit smaller though than previous releases, which is good to see, as it makes life a lot easier if you have limited space on your bench to work in. It also makes it easier to sneak past the missus when you’ve already promised her that you’ll not be buying anymore kits…. The box contains around 420 separate parts although 180 of those are for the tracks which should indicate the simplicity of this kit. There are eight tan sprues, eight brown sprues for the individual track links, a metal replacement barrel, two small photo-etch frets, upper and lower hull sections, a small decal sheet, colour/marking guide and assembly instructions. The instructions have been well laid out in sixteen easy to follow construction steps over twelve pages. At first glance nothing seems to be overly complicated about the build and should make for a fairly quick project. The colour/marking guide is supplied as a double sided glossy A4 sheet with two colour variants to choose from. 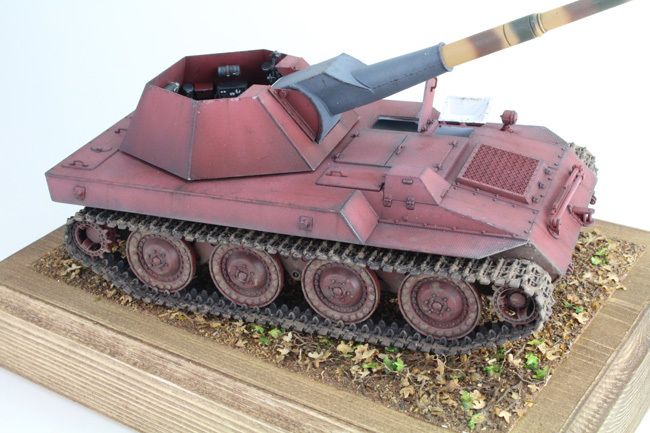 The first is in an overall Panzer grey scheme, with the second in a red oxide primer colour with a tricolor barrel. There is very little information around on the Waffentrager, so it’s quite hard to determine the validity of these marking options. Given what little information I could find though, they do seem to be fairly accurate. The decal sheet is hardly worth mentioning as it is quite small, but does contain dials for the driver’s compartment, although I found it easier to just paint the raised detail if I’m being honest. Being a prototype vehicle though the colour markings and decal options can be left up to the individual modeller. Overall the molding quality is very good. The details are very crisp with minimal flash and mould seem lines. Although there are a lot of pin marks, they should be fairly easy to deal with. Unfortunately some of these pin marks are in places that will be visible on the finished model, so you will have to deal with them if you want a more professional finish. A bit of filler and some careful sanding though should take care of the worst of them. The individual track links will require a bit of clean up, but other than being just time consuming, they seem simple enough to put together. Trumpeter have kindly supplied a helpful jig to assemble them on to give you the required sag if you choose to use it. There are replacement white metal tracks available online if that’s your preference, but I decided to use the kit tracks and try the supplied jig.